LEOMINSTER, Mass. 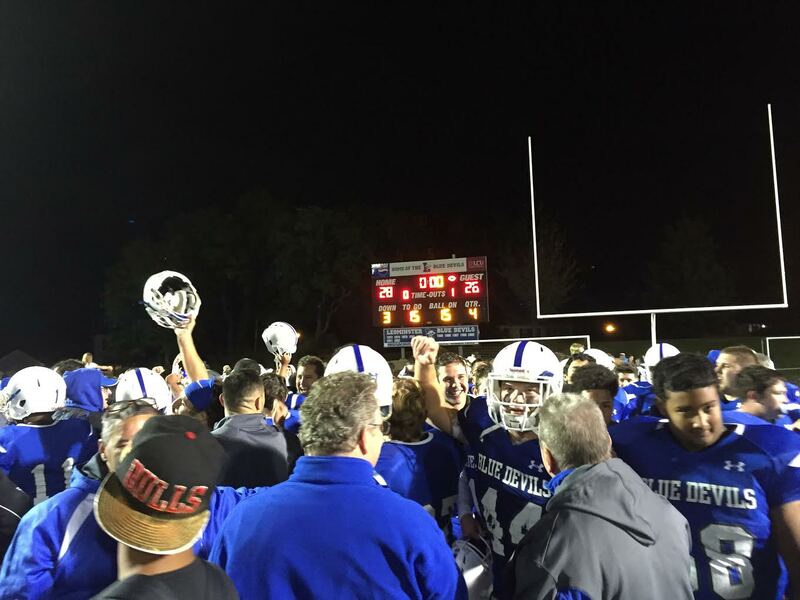 – The friendly confines of Doyle Field have seen many, many great games over the years, but this result might have been the sweetest for supporters of the home Blue Devils. Visiting Shepherd Hill (2-4) had Leominster (4-2) and Duke-bound wide receiver Noah Gray pinned down through three quarters. The Rams built a 13-0 lead on the strength of their ground game, and looked poised to seal the game with a “four-minute drill.” But, uncharacteristically, Shepherd Hill fumbled to give the Blue Devils a chance. That’s all Noah Gray (6 receptions, 92 yards, TD) and sophomore quarterback Pat Gallagher (16-of-25, 281 passing yards, 2 TDs, rushing TD) needed. The duo hooked up on a 35-yard touchdown reception to force overtime and put the Blue Devils on top 28-20 when Gray caught a two-point conversion after a touchdown in the extra period. After Shepherd Hill superstar Kevin Mensah responded with a dramatic 15-yard touchdown catch on third down, it was up to the Leominster defense to make a play, and they came through by stopping Mensah on the conversion attempt to seal a dramatic 28-26 victory. “We’ve had a rough first half of the season with all the pressure on us, but our losses are to two teams that are undefeated, so we can’t be all that bad,” began Leominster head coach Dave Palazzi. The Rams set the tone early with a 16-play scoring drive that took 8:20 off the clock in the first quarter. Kevin Mensah finished the drive with a 21-yard touchdown run to get Shepherd Hill on the board. Leominster was able to move the ball offensively, but failed to score from the visitors’ 11-yard line and went into the locker room frustrated and facing a 13-0 deficit. Those frustrations continued when the Blue Devils were stopped on fourth down after a lengthy drive to begin the third quarter. Yet the home team finally broke through when senior wide receiver Travis Storm turned a screen pass into an 82-yard gain to set up a one-yard score. Shepherd Hill superstar Kevin Mensah (10 carries, 97 yards, 3 total TDs) immediately responded with a 95-yard kick return to make it 20-6 and test the Blue Devils' mettle even further, but they did not back down with their captain leading the charge. Despite facing bracket coverage throughout most of the game, Gray used his 6-foot-4 frame to high point a 34-yard pass down to the Rams 11-yard line, setting up a six-yard touchdown run from Gallagher to make it 20-12. Yet with just over five minutes remaining in the game, the Blue Devils needed something of a miracle to stop a Rams offense that is built to milk the clock by running the ball out of their base Double Wing formation. They caught such a break when a toss from Rams quarterback Ryan Wong-Li to Mensah was mishandled, resulting in a critical turnover that set up a dramatic finish. Last season, it might have been Gray matriculating the ball down the field as the Blue Devils quarterback, but he’s happily handed the keys to the offense to Gallagher this season and the transition is clearly helping the team by putting Gray in position to make plays on the outside. Gallagher and Gray looked perfectly suited for their roles when the sophomore hit his senior wide receiver for a 35-yard score, and scored on a bootleg to log the two-point conversion and force overtime. On the first play of the extra period, Gallagher hit junior Allen Link (3 receptions, 23 yards, TD) for a score and once again found Gray for a two-point conversion to put all the pressure on Shepherd Hill. The Rams were able to get the ball to Mensah for a 15-yard touchdown reception, but the Blue Devils defense stood strong on a conversion attempt, denying Mensah the goal line and the visitors any chance to extend this classic battle at Doyle Field. After suffering brutal losses to unbeaten BC High and Wachusett Regional this year, the Blue Devils needed a win like this to get them back on track. Yet, even in the emotional throes of a close victory, Palazzi praised his adversaries.